The most wonderful time of the year seems to have a habit of sneaking up on everyone. Holiday to-do lists can get overwhelming if they’re left till last minute so it’s important to be organized during this busy time of the year. Stay ahead of the holiday hustle and bustle with this master holiday checklist. Print or share our variety of checklists that cover all of the bases or customize your own using our interactive checklist. The holidays seem so far away in September but there are advantages to planning ahead. If you book flights early, you can expect great savings. Speak to your family members about their plans so you know who is hosting who. This is especially important if you have transcontinental or international family members. Try to book domestic flights by the end of September and international flights by the end of August or the beginning of September. If your passport is due to expire, it’s best to renew it early. Getting a new passport typically takes 6-8 weeks barring any delays or mistakes. Keep your eyes open for off-season deals on holiday items like wrapping paper, holiday lights, holiday stationery and more. While preparing for Halloween don’t forget to keep your holiday to do list on track. It’s a good idea to get organized for upcoming holiday tasks as well as start to purchase some gifts and supplies. Discuss with your guests or host about overnight plans. If you need to book a hotel, try to make reservations at least two months in advance. There are many reasons to send a holiday card, one of the most fun being the chance to take new creative family photos. Use those updated shots to create some great personalized wall art for your home. Make sure your list reflects any changed addresses and new friends that you may want to include in your 2018 holiday card list. Make sure that you have everything that you need to wrap presents. This includes wrapping paper, tape, scissors, ribbon and gift tag stickers. If there are any expensive items on your gift list, price track them through email updates. Keep tabs on price trends to get the best deal. Try to keep a physical or digital calendar of all of your holiday engagements so you don’t double book yourself or your family. Try a personalized calendar for a charming and special touch. In order to stay ahead of the holiday rush, the beginning of November is a great time to do the bulk of your shopping and holiday tasks. Begin designing your card a couple of weeks before you plan on sending them. This will give you time to make edits and try out different custom holiday card designs. If you plan on sending any of your holiday cards overseas, it is best to send them by mid-November to account for potential delays. If you are planning to send Hanukkah cards it is best to send them out in mid-November so they arrive on time. If you are looking to spread the holiday cheer, consider donating your time or resources and getting your kids involved with great holiday causes. Some of these activities could include sending soldiers holiday cards, hosting a food, clothing or toy drive or volunteering at a soup kitchen or food bank. Put together a comprehensive list of all of the gifts that you need to get. To make shopping easier on yourself, try grouping the gifts by where you plan to purchase them. Figure out an estimated food budget based on how many people you are hosting. It’s also a good idea to make a gift budget — any gifts that don’t fit into your budget for the holidays can be saved for birthdays and future holidays. Try to find time to shop during the weekdays, the stores will be a lot less busy. Take advantage of stores and online sites that gift wrap and ship gifts directly to the recipient — it will save a lot of time. Wrapping gifts as you purchase them will keep the task from building up at the last minute. It will also keep curious eyes from seeing their gifts before they’re supposed to. Before you’ve even had time to finish your turkey dinner, the holiday shopping craze will already be in full swing. Take advantage of all of the sales and prep your holiday decorations. You can address the cards yourself or use a recipient addressing service. Utilizing free recipient addressing and custom envelopes will save you a lot of time. It seems like stores roll out their Black Friday deals earlier every year. Do your research so you know whether there are any deals you want to pursue or if you can avoid the commotion all together. Small Business Saturday is a great way to support local businesses and knock some more items off of your gift list. Cyber Monday is perfect for those who don’t want to deal with busy stores for their holiday shopping. Get all of the gifts that you need from the comfort of your own home. Plan out where you are going to put your decorations and see if you need to restock anything. Plug in your all of your light strands and test them before hanging them up anywhere. Take out your festive dishware and make sure that you have enough dishware for the amount of guests you are expecting. Custom holiday plates are a fun addition to holiday meals and make great gifts too. Now is a good time to plan holiday gift exchanges for your family, friends and/or coworkers. Start to gather materials for other holiday games and party activities as well. December is here! That means it’s time to break out the decorations and holiday sweaters. It’s also the ideal time to plan holiday food menus and mail cards and gifts. Now is the time to do any last minute shopping and to confirm all of your holiday plans. This is also a good time to cook and bake some freezable items, like Christmas cookies. It’s best to send out your Christmas cards during the first week of December so that recipients will get them in time. There are Christmas card mailing solutions and custom address labels that make addressing and sending cards a fast, easy and stress free process. New Year’s cards are a great non-denominational option. It is best to send holiday party invitations about 2–3 weeks prior to your party to give guests enough notice to RSVP. Try unique postage stamps for a perfect festive addition. Now is a great time to decorate. Hang your stockings, garlands, Christmas wreaths and more. to transform your home into a holiday haven. Decorations only get to stay up for a couple of weeks — so the earlier they go up, the better. This is the best time to buy your fresh christmas tree and garlands because your tree should last three weeks to a month. If you use a reusable Christmas tree, this is the time to pull it out of storage. Decorating the tree is the perfect family activity. A decorated tree is the cherry on top of christmas decorations, so put up the lights and hang your favorite ornaments. Check to see if your holiday party outfits require dry cleaning or are good to go for the holiday festivities. Make sure to order all of your special holiday foods well in advance. Then set a reminder or make a note in your calendar so you don’t forget to pick them up. Having a case of wine or a couple of tins of holiday treats is a great option should you need a last minute gift. These simple gifts can be bought in bulk and are great for neighbors, acquaintances and coworkers. Finalize your holiday food menu with your budget and potential food allergies in mind. Figure out which dishes can be cooked ahead of time and how far in advance you can cook them. The more that you can get done before Christmas Eve the less stress you’ll feel on Christmas Day. Create a food ingredient shopping list so that you don’t forget any vital parts of your holiday meal. Using your cooking plan as a guide, make a shopping list that’s broken down by when you need the ingredients by and which stores you will purchase them at. It is always good to have extra baking and cooking ingredients around during the holidays. Stock up on long lasting products like sugar, flour, stock and more. Finish your online shopping this week to account for delivery delays. It’s also the best time to mail out the remainder of your gifts to avoid paying for rush shipping later on. Christmas is right around the corner! Take this time to organize your home and prepare for visitors. Check in and confirm your travel plans, then get excited to see family and friends! If you are traveling for the holidays this year, now is a good time to pack your bags and prepare for your trip. Polish silverware and dust off your china and crystal for special holiday meals. Cookies last up to three months in the freezer — which makes them the perfect item to premake for a convenient last minute food gift or party treat. This is the last week to order and send gifts to be sure that they’ll arrive in time. Be ready for holiday parties during the days that lead up to Christmas. Consider taking time in between the celebrations to prepare as much as you can for Christmas Day. Consider getting a head start on cleaning your house. Once the detail cleaning is out of the way, all that you’ll have to do is some touch ups before guests arrive. Finish wrapping and putting on finishing touches like bows and custom gift tags. This is a great time to distribute holidays gratuities and gifts to service people like your mailman, landscapers and house cleaners. Figure out who’s sitting where and consider creating seating cards for a special touch. Try to get the bulk of your food shopping done before the stores get too busy, excluding fresh ingredients. Iron your linens for a crisp, picture perfect holiday table setting. You’ve worked so hard to get everything put together — now is the time to tie up a couple of loose ends and relax with family and friends. Pick up your holiday ham, turkey or other holiday food that you ordered ahead of time. Be prepared for traffic and long lines at grocery stores. Cook any dishes that will last ahead of time. Save time by storing dishes in the container or platter that they will be served on. Give your holiday decor a fresh touch with festive floral arrangements and pine scented greenery. Set your Christmas table decor up ahead of time and see if you need to adjust anything or add any decorations. Add the last finishing touches to your holiday home decor. Make creative holiday card displays to feature your guests’ holiday cards. Custom candles are an aesthetic and aromatic addition. Do a quick inspection of your home and see if anything needs to be cleaned again before guests arrive. You’ve made it to the main event! Between cooking and entertaining, try to take time to relax and enjoy the time with your family — you deserve it. Buy fresh ingredients and items like fresh bread. Be aware that many stores will have shorter hours, so make sure to check ahead. Make sure that your electronics are charged up and ready to capture your holiday memories. 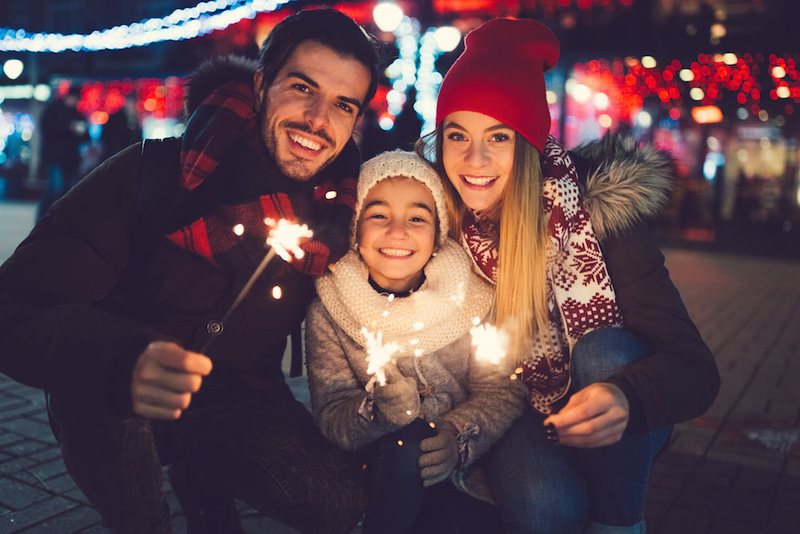 Combine candid photos of your kids and poised family portraits in a holiday photo book so those memories can be shared and cherished for years to come. Wrap any extra gifts so that they’re under the tree before Christmas morning. Have your kids help you set out cookies and milk for the Santa and veggies for his reindeer. Making a card or a festive drawing for Santa is the perfect holiday activity for your kids and as a bonus it will keep them occupied while you prep. For an easy project, use printable christmas coloring pages. Click on any of the checklists below to download and print them. This comprehensive guest checklist is for those who plan to travel for the holidays. If you are hosting this year, stay on track with this holiday host checklist. Make sure you don’t miss anything with this concise last minute holiday checklist. Stay organized and don’t miss anyone with this helpful holiday gift checklist.